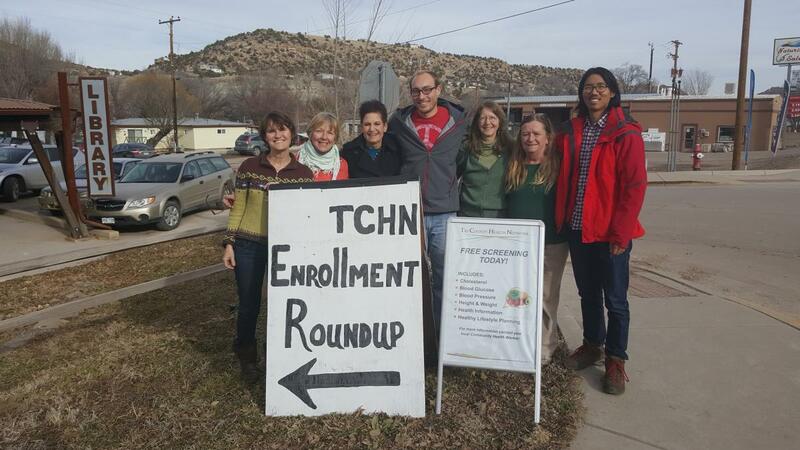 TCHNetwork team members in November 2015 at the Naturita Community Library, a strong network supporter in the West End of Montrose County, CO. The network’s community health worker offered free heart health screenings at the library that day, and a network team also helped enroll people in health insurance. The Tri-County Health Network (TCHNetwork) is a nonprofit organization committed to improving the overall health and quality of health care in rural southwest Colorado by identifying, developing, and operating programs and initiatives that will reform the health care delivery system and payment methodology in rural communities while providing solutions to critical health care needs and health disparities. It is the collective vision of TCHNetwork, its Board of Directors, Network Members, staff and community stakeholders, to eliminate barriers to health care for our designated “Medically Underserved Community” population of over 53,000 in the tri-county area we serve. Lynn Borup, executive director of Tri-County Health Network, was interviewed by NCHN’s director of member services to share information on the network’s characteristics, key learnings, accomplishments and challenges. A: That’s a big nutshell. We’re a vertical network of rural providers focused on health care reform, population health and prevention. We help our providers develop the tools and skills necessary to take advantage of national health care reform. TCHNetwork also plays a role in increasing public health and expanding our providers’ boundaries. With our efforts, we are increasing access to care and removing barriers. This ultimately helps improve health outcomes. We are capitalizing on our existing resources to improve overall population health. A: A big benefit is the opportunities that have been opened at the state level (Colorado). Our collaboration is improving visibility for our providers and our communities. For example, there’s a coalition in Denver which highlighted the impact the ACA had in one of our regions—tracking this community for over a year. A number of our clinics and public health departments have been awarded State Innovation Models (SIM) grants. We believe part of the reason these grants were won is because of our existing collaboration on other initiatives. Historically, our rural clinics worked in isolation. With our first Health Resources and Services Administration (HRSA) grant, we were able to develop a committee of physicians to adopt best practices around treatment of diabetes and heart disease in order to standardize care across the network. This has allowed them to be more proactive and less reactive in providing care. It has also created peer connections. Providers now have colleagues to bounce ideas off of. Q: What’s unique about your rural area? A: The distance needed to travel for basic services. It’s a minimum of an hour and a half to get to any town that has a Wal-Mart, and that includes traversing two mountains. There’s never enough resources in rural health care. We don’t have any specialists, and we have tremendous barriers not seen in urban areas. But, the advantage is you can turn on a dime quickly. There’s not as much red tape. You know the players needed in order to effectuate change. A: We’ve been very successful in receiving funding. This has surprised me, because we are rural and have such a limited population. I suspected grantors would be unlikely to invest so much in our area. It’s also been eye opening to learn how much our clinic partners have on their plates. Q: What have been your keys to success? A: I think it’s been trying to send consistent messages. Having champions and counting everyone’s voice. We try to have more frequent meetings before things go awry. It’s also important to make sure we have the right people at the table. Developing trust is key. It’s all about relationships. My board is accommodating and honest, and this trickles throughout the membership. Trust has been built over five years. A: Trying to figure out how to effectively implement programs and decisions made by the administrators within each clinic. Providers have been asked to adopt and engage in different programs outside their usual services in addition to their overflowing plates. It’s necessary to be patient—change doesn’t happen overnight. The clinical buy-in was the most difficult part. In a small community, there are only so many people, so you talk to the same people. Decisions not being made and dictated by their own team was challenging for them. It’s really a culture change they’ve been a part of. A: Obviously, it’s important to surround yourself with a strong team. That’s huge. It’s important to have clear expectations and that everyone understands their roles. Also, don’t be afraid to ask for help. Don’t recreate the wheel. Find existing resources that can give you a running start. I really think networks are important in rural areas and can be powerful. Be sure to make your collaboration an official network—ensuring commitment and gaining credibility. This can help with some funding options. Also, it’s great working in a rural region, as there’s a sense of community and people know and care about each other.